Few Americans enjoy getting called for jury duty, but for some, it can create real financial problems. The court allowed Grotto to postpone her service, but that wasn’t the end of her jury-duty money struggles. “When I got called at the end of the year, I had gotten a new job, and my company didn’t pay on days when you had jury duty. So it actually ended up being a worse situation,” she says. If you’re not salaried — whether you’re a freelancer, a business owner, or an hourly worker — jury duty can be an expensive burden. Though jurors are typically reimbursed for transit expenses and do receive a stipend, it’s not a living wage. Even if you make only minimum wage, serving on a jury instead of going to work will usually cost you money. Your employer might continue to pay you, but that’s not typically required — and if you’re a business owner, you’re out of luck. Freelancers and other self-employed people may face long hours or miss out on jobs. Juror pay depends on the court in which you serve. Federal jurors are paid $40 per day, or $50 for longer trials. Not all courts are so generous, though. Jurors for Los Angeles County, for example, are paid $15 per day, and only after the first day. If you work full time making the federal minimum wage ($7.25 an hour) and serve for five days on a federal case, you’ll be $90 short on your weekly budget. 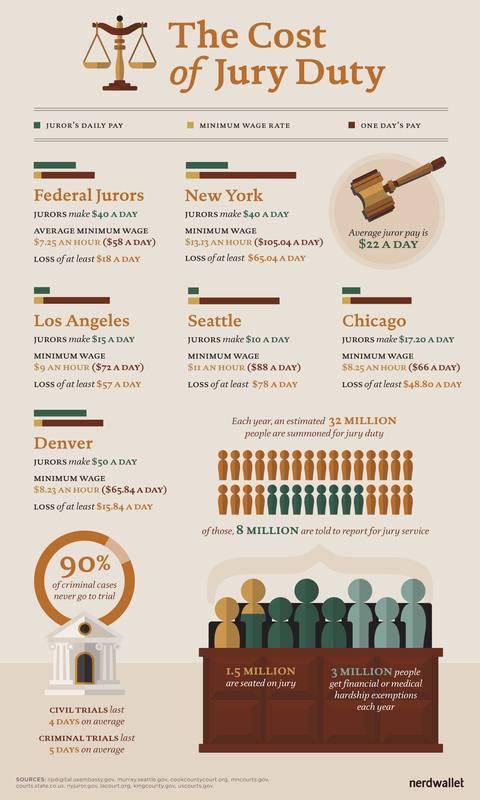 If you make $15 per hour, you’ll be $400 short — and it can take weeks to be paid for your jury time. At Seattle’s municipal court, for example, where jurors get $10 a day, checks don’t go out until 30 days after you complete your service. Good news: If jury duty will put a serious strain on your budget, it is possible to ask for a financial hardship exemption. According to the U.S. State Department, an estimated 3 million exemptions for financial or medical reasons are granted each year. Bad news: Exemptions are given solely at the court’s discretion, and there’s no guarantee you’ll be approved. Methods for requesting an exemption vary. You might have to call the court clerk before your service date or return paperwork you receive with your summons. In other jurisdictions, you can ask for an exemption only after you’ve shown up for jury duty, or have been called to a trial. The amount of income you stand to lose could affect your likelihood of receiving an exemption. Bringing proof of your pay and expenses with you to court can help your case. The expected length of the trial to which you’re called is also a factor. Christopher Michel, a former legal support analyst for the New York State attorney general, says that in his experience, judges would excuse jurors from long trials without much fuss, although those dismissed jurors might then be selected for another, shorter trial. If the timing is particularly bad on your jury summons — for example, if you have a freelance project due that week — you might ask for a postponement instead of an exemption, meaning you agree to perform jury duty at a later date. But if you don’t qualify for either, you’ll have to show up at court. There’s still hope, though. State Department data show that only about a quarter of the people who receive a jury-duty summons are actually told to report, and fewer than a quarter of those who report are actually seated on a jury for a trial. Even if you are seated, the average trial lasts five days or less. Justice might cost you, but with any luck, it won’t cost you much.